To walk through our wine cellars in Epernay is to enter the very heart of Moët & Chandon. Located 10 to 30-meters under the chalky soil, Moët & Chandon’s cellars are the largest within the Champagne region, spanning 28km (aprox 17.4 miles). In this legendary subterranean labyrinth, the forces of nature have come together to create a uniquely ideal setting for the metamorphosis of choice fruit into the House’s luxurious wine. Select grapes undergo their transformation into champagne in conditions where temperature and humidity levels are constant and unchanging. After this first visit, enjoy the scenery whilst driving along the Champagne wine road to reach the village of Hautvillers, the birthplace of Champagne, where Dom Perignon invented the precious beverage at the end of the 17th century. In 1668 he was transferred to the Abbey of Hautvillers where he served as cellarer for the rest of his life. 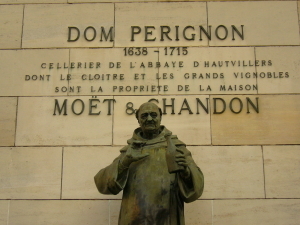 Enjoy a private visit at the Church of the Benedectine Monastery owned today by Moet & Chandon and discover where Dom Perignon is buried. When the french Benedictine monk died in 1715, as a sign of honor and respect, he was buried in a section of the abbey cemetery traditionally reserved only for abbot. Following this, you will have a gastronomic lunch (not included) in a traditional restaurant in Epernay. Because of its strategic geographical situation, Epernay, surrounded by vineyards is known as the Capital of Champagne. In accordance with your wishes, we will make a booking at the best place. Our guide knows all the authentic and local restaurants far from the tourist crowds. Time for digestion! Following your lunch, you will visit the most prestigious House of Champagne in the world: Moet et Chandon, or similar (we can make arrangements to view other houses following your wishes such as; Ruinart, Veuve Cliquot, Pommery…) and you will discover the opposite of what you saw in the morning: Luxury and Prestige! Enjoy a final tasting in the biggest cellar of Epernay before heading back to Paris in the late afternoon, where you will be dropped off at your hotel around 6.00pm. Regularly scheduled tours of the cellars followed by a tasting can be enjoyed throughout the season and bespoke tastings and tours can be arranged at your convenience. The Moët & Chandon Visitors’ Centre is undergoing renovations and the cellars will be closed for a period of one year from 1st October 2014. Reopening 1st October 2015.